The Texas Coast is home to a multitude of wetland varieties, which play an important role in the health of our ecosystem and supports our economy. In a recent report by the Dogwood Alliance, “Treasures of the South: The True Value of Wetland Forests,” it’s estimated that Texas’s wetland forests are worth approximately $53.9 billion – providing valuable benefits to the surrounding environment and native species, as well as our communities across the United States. 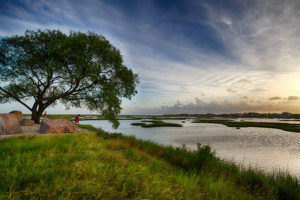 Across coastal communities, wetlands provide numerous benefits – such as protection from extreme weather events, alleviating flooding by acting as a natural sponge, and providing water purification and waste/pollution filtration. Additionally, wetlands provide recreational and tourism services. In Texas alone, tourism and recreational activities in wetland forests resulted in $13.5 billion revenue. Wetland forests are habitat for a wide array of species including migratory bird populations, fish and shellfish species, and the National Wildlife Federation estimates that nearly one-third of the U.S’ endangered species population relies on wetlands either directly or indirectly for their survival. Unfortunately, our wetlands are at risk. Due to unabashed development and logging across the Gulf South, we lose a significant portion of our wetlands each year. This is detrimental to our communities as wetlands are critical for flood protection from major rain events and storm surge. Approximately two billion people live in high flood-risk areas. This is expected to increase as wetlands are degraded and destroyed. Standing up for wetland forests creates a legacy that benefits everyone. By investing in natural solutions and infrastructure, we can improve, restore, and protect our wetland forests for generations to come.